Nepal and People’s Republic of China (PRC) signed eight agreements worth $2.4 billion, including deals to develop hydroelectricity, water resources, cement factories, and fruit industries in Nepal. 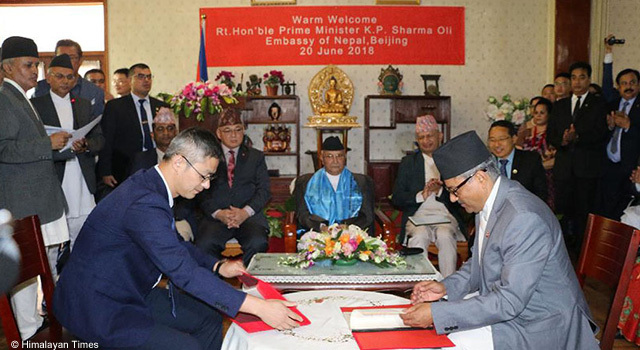 The signing ceremony took place in Beijing during Nepal Prime Minister KP Sharma Oli’s visit to PRC on 20 June 2018. Agreements were signed between the government and private corporations of both countries. Among the deals signed was a joint development agreement among Yunnan Xinhua Water Conservancy and Hydropower Investment Company, Hydrosolutions Group and Shanghai Investigation, Design and Research Institute for the 164-megawatt (MW) Nepal Kaligandaki Gorge Hydropower Project. Also signed were agreements for cooperation for the construction of the 40.27-MW Siuri Nyadi Hydropower Plant Project, the 600-MW Marsyangdi Cascade Hydropower Project, and the 75-MW Trishuli Galchhi Hydropower Project.